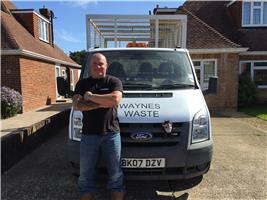 Waynes Waste - Rubbish/Waste/Clearance based in Worthing, West Sussex. At Waynes Waste we pride ourselves on providing a clean, professional service to all of our customers. We can give you a free quote for rubbish clearances, from garden waste to household and building waste. All waste removed will be screened and recycled as much as possible, with the remainder being disposed of at a licensed waste transfer station. We also offer regular contracts if required.